Every summer needs a party anthem. A song like "Love Shack", "Funky Town" and "Ice Ice Baby" that dominates the number 1 spot, and provides the soundtrack to long evenings and beach holidays. This week in 1983, the party anthem for the summer of '83/'84 debuted on the ARIA singles chart. The singer behind the tune had good reason to party. His solo career had got off to a good start, and soon went into overdrive as his new single and album both went to number 1. This week in 1983, another act enjoyed both a number 1 single and album - in this case, simultaneously. "Karma Chameleon" and Colour By Numbers remained on top of their respective charts for a fourth week. Moving Pictures really couldn't win at this point - even epic ballad "Where They Belong", which featured Nicole Kidman in the video, couldn't recapture chart glory for the Sydney band. His duet with Paul McCartney moved into the top 10 this week, but the latest single from Thriller became the first to miss the top 50 for Michael Jackson. "Human Nature" would be memorably sampled by SWV in 1993. Rick Springfield would continue to have decent-sized hits in America for some time, but this second single from Living In Oz (a number 18 in the US) kicked off a string of flops locally. The second top 100 appearance by The Frames - the first, "Please Listen To Me", reached number 90 in 1981. It would seem the Perth band are still active... even if they haven't put their songs on YouTube. As "Down Under" fell back out of the top 20, the latest single from Cargo made a fleeting visit to the top 100. For some reason, "High Wire" was only released on 12" in Australia. 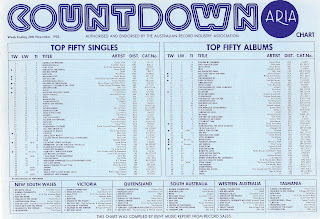 "Maxine" had provided Sharon O'Neill with her highest ever chart position in Australia, but she had no such luck with this third single from Foreign Affairs. A nice enough tune, but kind of forgettable. Yet another in their run of UK top 10 hits (13 since 1979), this stand-along single featuring a steel drum band and gospel choir didn't impress Madness's Australian fans. I've always thought The Motels should've been more successful than they were - and this lead single from fourth album Little Robbers is another song that deserved better, not even managing to place inside the top 30 like 1982's "Only The Lonely" and "Take The L". Could it have been a problem of timing? The Motels' singer, Martha Davis, was inspired by the end of summer to write "Suddenly Last Summer" and Australia was just head into its warmer months. In the US, where it had been released as summer turned to autumn, the song reached number 9, equalling the peak of "Only The Lonely" to become the band's equal-highest charting song there. In Australia, that honour went to breakthrough hit "Total Control" (number 7 in 1980). Here's another song that was the highest-charting for the band in question in their home country. By reaching number 4 in the UK, this lead single from Genesis's self-titled album out-performed all other releases before and after it. "Mama" didn't do so well in Australia, but the track about a young man's infatuation with an older prostitute did return the band to the top 50 for the first time since 1981's "Abacab". Even though the trio had continued to shift away from their prog rock roots on Genesis, old habits died hard and the album version of "Mama" ran to almost seven minutes. It was cut down to just over five for the video and radio edit. These days, Tim Scott goes by his full name, Tim Scott McConnell, or musical alter ego Ledfoot, and seems to have distanced himself from this new wave-ish track. "Swear", which reminds me of the type of thing Oingo Boingo would've released, appeared on Tim's debut album of the same name. A year later, Sheena Easton recorded a cover of the song for her A Private Heaven album, and it became a minor hit in the US following "Strut" and "Sugar Walls". 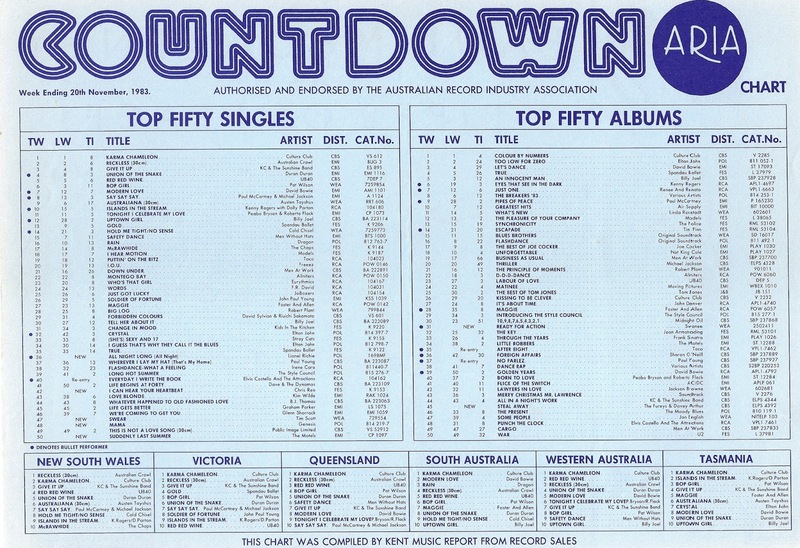 Our third minor hit to peak in the 40s comes from an artist who didn't actually have that much chart success in Australia, but whose songs I'm disproportionately familiar with for some reason. "I Can Hear Your Heartbeat" was the only single by Chris Rea to make the top 50 in between his two big hits, 1979's "Diamonds" and 1987's "Let's Dance". Like "Josephine" and "On The Beach", it's also one of those songs you know as soon as you hear it (although you'd probably never remember it otherwise). If you were grading Lionel Richie's post-Commodores solo chart career, you'd probably give it a B. Solid work (a number 1 duet with Diana Ross on "Endless Love", a top 10 single with "Truly", and a top 20 single with "You Are" and album with Lionel Richie) but room for improvement. Lionel rose to the challenge admirably. "All Night Long (All Night)", the lead single from his second album, spent six weeks at number 1. The accompanying album, Can't Slow Down, not only topped the chart for three weeks, but ended 1984 as the year's biggest album and ended up spending almost two years in the top 50. 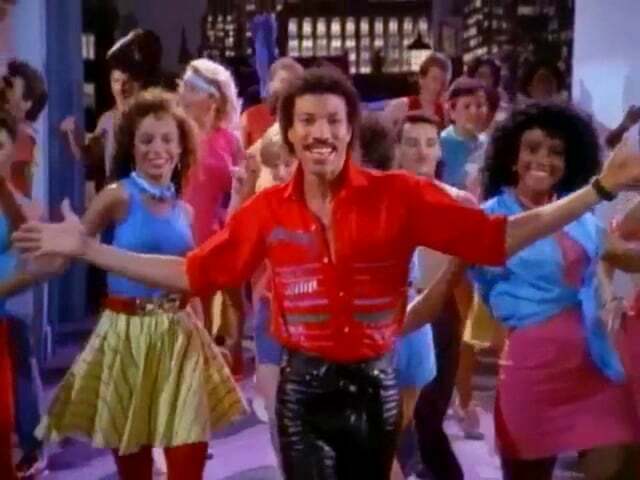 Chart stats aside, "All Night Long (All Night)" saw Lionel develop as an artist as well, with the singer moving away from his trademark syrupy love songs to release a feel-good party tune. Apparently, his record company were against the calypso-flavoured track, but Lionel insisted the song had "the rhythm the whole world dances to on vacation". Well, those who holiday in the Caribbean anyway. Adding to the international feel of the song, Lionel added in some African-style phrases he'd invented. Yep, "tambo liteh sette mo-jah" is meaningless. He had attempted to include some authentic African lines but ran out of time, especially when it was explained to him just how many different dialects there are. In the end, Lionel was onto something and "All Night Long (All Night)" became a global smash, paving the way for an A+ few years for him. Next week: a song I never knew was a cover version, plus the latest technology-themed hit reaches the top 50. 'Human Nature' is quite pleasant. I must've heard it on my dad's 'Thriller' LP, but don't recall listening to the whole song before. I'm surprised the Rick Springfield track didn't do better. I didn't know it until a rage airing a couple of years ago. 'Wings of a Dove' doesn't sound very 'Madness'-y. I didn't know 'Mama' at the time, but don't mind it. I didn't know 'Swear' before, but the bass is Oingo Boingo-ish. Didn't think I knew the Chris Rea song, but the chorus seemed familiar, and I actually liked it. I wonder what the point of putting '(All Night)' in parentheses was? I didn't know the chants were mumbo jumbo.